From the free car park at the end of Gries, follow the path to the Sulztal. For the ascent to the Amberger hut about 2 hours walking time must be planned. Here the first 500 meters of altitude are overcome. From the hut, you continue into the valley (Sulze). Further, the path leads west through a steep step in the divided by a railing back Roßkar. Here you have the choice of using the left or right trough for the ascent. Now you have reached a height of 2700m. Continue on two steep steps south to Roßkarferner and over a small glacier remainder before it comes in a wide right arc to the southern peak of the Kuhscheibe. The last few meters to the summit are mastered with skis on the back. The climb requires a lot of strength and time, so we recommend an overnight stay at the Amberger Hütte. Triggering is very probable even from low additional loads, particularly on the indicated steep slopes. On some steeper slopes, medium or even fairly large spontaneous avalanches may occur. On most steep slopes the snow layer is only moderately or weakly stable. Expert avalanche knowledge is absolutely required. You must avoid the indicated steep slopes and highly exposed sections. Avalanches are likely to be triggered on many of the indicated steep slopes even if only light loads are applied. In some places, numerous medium-sized and also large-sized natural avalanches are expected. The snowpack is poorly bonded on most steep slopes. Choose your route according to these criteria, select only moderately steep terrain by avoiding the avalanche runout zones. Very expert avalanche knowledge is required. Numerous huge or very large-sized natural avalanches are expected also in moderately steep terrain at any time. Safe skiing is not possible anymore, not even in the marked ski area. The snowpack is poorly bonded and largely unstable. 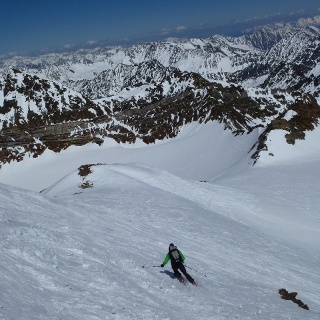 Don't go ski mountaineering at all! 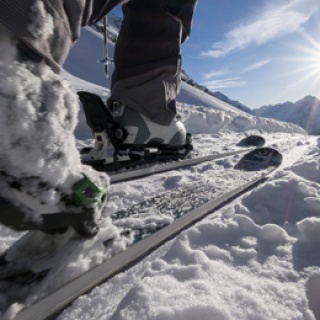 The "standard ski mountaineering equipment" is: touring skis with touring bindings, telescopic poles, climbing skins, ski crampons, digital avalanche transceiver, avalanche shovel, avalanche probe, first aid kit and mobile phone. A ski helmet can prevent severe head injuries. A "complete glacier equipment set" contains: sit harness, two prusik loops of different lengths and ascenders, two HMS carabiners, ice pick, climbing irons, bivouac bag, airbag system and rope. Pack your rucksack carefully and don't forget extra clothes for the descent, sun protection/cream, cold protection, enough food and drink. 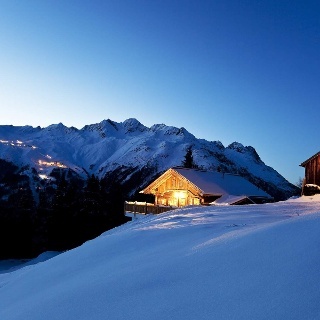 If you stay overnight at a mountain hut take toiletry articles and a hut sleeping bag with you. Easy: easy, short to moderate long tours with climbs that do not exceed 25 ° or only for a short time. Medium: Moderate, moderately long to long tours with climbs that do not exceed 35 ° or only for a short time. Difficult: Difficult, long to very long tours with climbs that reach 40 ° or more, and climbing passages up to the II degree of difficulty (UIAA). The right tour planning and schedule: start the tour early enough and return before dark. In spring you should be back at the hut for lunch (avalanche danger). Groups should ascend one behind the other with a minimum distance of 10 meters in order to avoid heavy loads on the snow layer. 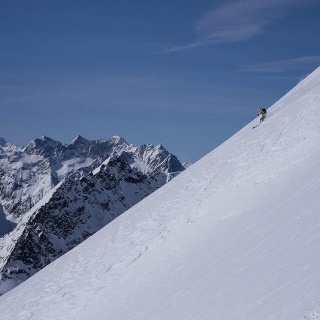 While skiing downhill a distance of about 30 meters is strongly recommended. The most common cause of accidents: falling on downhill stretches. The right skiing technique and moderate speed according to the abilities and the snow conditions reduce this risk considerably. 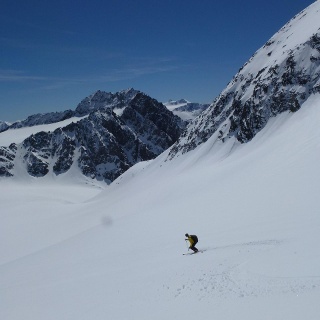 If you enjoy activities amid nature always respect the local guidelines when you set out on a ski tour (e.g. wildlife preserves, hunting enclosures, reforestation areas, information boards, etc.). 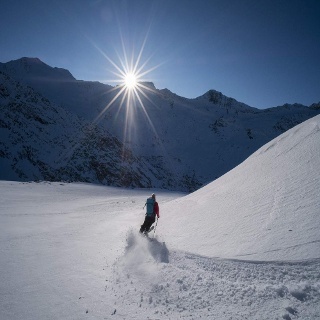 Ötztal Tourismus assumes no liability for the tours listed and recommends taking along a mountain guide. Before starting a tour you should announce in the valley the destination and the time of the expected return. It is strongly recommended to bring an avalanche transceiver. From the parking lot in Gries to the Amberger Hütte you are partly on prepared paths (toboggan run) on the way. The tour continues into the Sulze into to the peak is untouched terrain. In the end of the village of Gries you will find a free parking space.